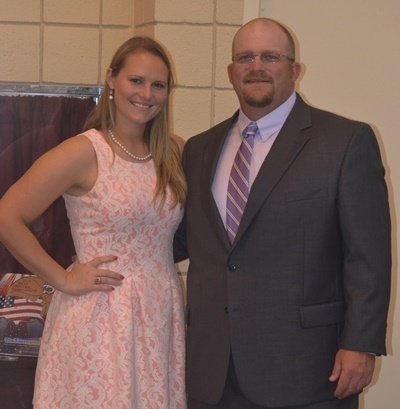 Cea Knox, pitcher for the Salkehatchie Indian Softball team from 2007-2009, was inducted into the USC Salkehatchie Hall of Fame on April 19, 2015. Knox, who could be the best example possible for attending a NJCAA institution, would go on to do great things for Salk… on the softball field and in the classroom. However, it is all the things she has continued to accomplish since leaving, that speak volumes about her and her choice to attend a junior college and play a sport. Knox holds many records for softball at USC Salkehatchie including: Most Wins, Most Innings Pitched, Most Shut-Outs, Most Saves, Most Starts, Most Complete Games, and the all-important Most Strikeouts. She is also second in Salk’s history book for the lowest ERA. Knox was just as dangerous at the plate as she was in the circle; holding the record for the Most Doubles by any hitter. She also holds the number two spot for hits, walks and RBIs and is in the number three hole with games played, batting average, at-bats, and runs. While at USC Salkehatchie, Cea was selected as ESPN Magazine Softball All-American and All-District team as selected by the National Association of Sports Information Directors: a rare honor for junior college players. She was named Female Athlete of the Year in 2009. Serving as a senator her freshman year and as Vice President of the Student Government Association her sophomore year, Cea was very involved in government and campus activities. Receiving her Associate of Arts degree from USC Salkehatchie with high honors, Knox would also be named an NJCAA Academic All-American. She would continue her education and softball career at Francis Marion University, where she received her B.A. degree in 2011. However, Knox wasn’t done with her education. She moved to Florida and will graduate from law school in just a few weeks.